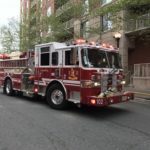 November 15, 2018 – At 7:50 pm, Arlington County Fire and Police Departments were dispatched to the 500 block of N. George Mason Dr. for a reported house fire. Engine 102 arrived on scene with no fire evident on a two-story single-family dwelling. They were met outside by the occupant. Upon investigating Engine 102 found smoke conditions on the second floor but were unable to locate the source. The wooden siding on the exterior was opened and fire was found in the wall of the house. The fire was extinguished, utilities were controlled to the house and units checked for fire extension. The occupant was evaluated by medics and did not require EMS services. No firefighter or civilian injuries were reported. The occupant was displaced as the home was determined to be uninhabitable by the Fire Marshal and the County Inspection Services Division. The Fire Prevention Office investigated the cause of the fire and determined the cause to be a corroded wire that was arcing and ignited structural members in the house. Damages from the fire were estimated at $5,500. If you smell or see smoke in your home, call 911. Don’t wait to see fire. While there was still damage to this home, we were able to catch this fire while it was small. Damage was limited and no one was injured.